Cite page (MLA): "Livingstone Online Outreach Worksheets." Livingstone Online. Adrian S. Wisnicki and Megan Ward, dirs. University of Maryland Libraries, 2018. Web. http://livingstoneonline.org/uuid/node/88827c23-c292-4e86-ad55-2431062e5986. This page introduces the eleven educational worksheets for children aged 9-13 created by the Livingstone Online’s Outreach Program. The page also allows users to download the worksheets or to view them online. Livingstone Online’s Outreach Program (2013-15) resulted in the production of eleven educational worksheets for children aged 9-13. Each of the worksheets uses a single letter, diary entry, or piece of text written by David Livingstone to encourage students to reflect on an aspect of Livingstone’s life and/or world. The links below provide access to the worksheets in PDF form, allowing teachers and others to view these worksheets online or to save them to their own computers for classroom study and other activities. The worksheets are released under the Creative Commons Attribution-NonCommercial 3.0 Unported license in order to promote the broadest possible, non-commerical use. To learn more about our outreach program, please email Megan Ward (Livingstone Online Associate Director) and/or Kate Simpson (Livingstone Online Project Scholar). Click here to download all eleven worksheets plus the two bonus documents in a single .zip file. Free programs for extracting .zip files can be easily found on the internet. 1) David Livingstone: Mill Boy - allows students to explore what life was like for Livingstone as a child working in a factory in Victorian Scotland. It provides them with a passage from Missionary Travels to practice their deep reading and analysis skills. 2) David Livingstone: Doctor - introduces the history of diseases such as malaria. Students can use Livingstone’s letter to practice their deep reading skills and understand how diseases were treated with limited resources. 3) David Livingstone: Crossing Cultures - facilitates student discussion on different cultures and what happens when those cultures meet. Analysing the letter included will allow students to understand exploration in the nineteenth century. 4) David Livingstone: African Animals - encourages students to explore conservation issues around endangered animals. This worksheet introduces students to one of the most well-known incidents in Livingstone’s life, that of being attacked and bitten by a lion. 5) David Livingstone: Global Citizen - urges students to explore the term global citizenship and what it means to them. Students can use Livingstone’s letter to practice their deep reading skills, finding out what the letter reveals about nineteenth-century perspectives on global life. 6) David Livingstone: Reading His Words - enables students to explore the process used by the Livingstone team to read some of Livingstone’s most faded diaries. The worksheet introduces multi-spectral imaging and its use in the field of humanities to students and encourages them to think about different ways of studying the past. 7) David Livingstone: Missionary - facilitates student discussion around Christian missionaries and specifically Livingstone. This worksheet encourages students to use their deep reading skills to explore Livingstone’s beliefs. 8) David Livingstone: Geographer - allows students to discover part of one of the journey’s Livingstone took. 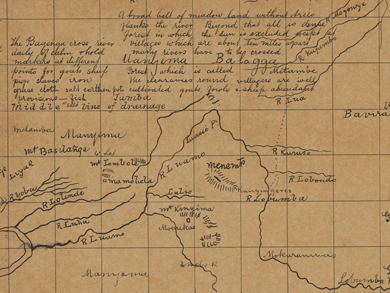 It encourages students to practice deep reading and textual analysis to explore Livingstone’s letter, which covers questions of geographical distance and time. 9) David Livingstone: Victorian - encourages students to explore Victorian culture and the influence of Britain on certain African countries in the nineteenth century. Through the letter students can analyse how goods and people moved around the globe before airplanes. 10) David Livingstone and America - introduces the American journalist Henry Morton Stanley, who famously met Livingstone in November 1871, in what is now Tanzania. The letter included enables students to practice deep reading and textual analysis to explore Livingstone’s feelings towards the African slave trade. 11) David Livingstone: Abolitionist - offers a new way to understand the slave trade and abolition. Students can also explore the nineteenth-century British Christian ideas of morality and how morality may change over time.